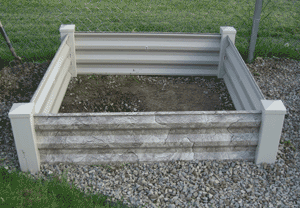 I’m always on the lookout for places to buy raised garden beds (and square foot garden beds), and have I found a great option! 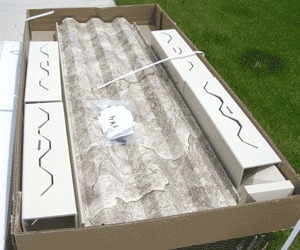 This is called the Easy Garden Box and it is available to purchase at nurseries across the country, or on Amazon.com! I have to admit, this may be my favorite garden bed so far. It’s super easy to put together, very sturdy, and just a little deeper than most vinyl boxes. I’ll walk you through the setup. . . Here is a picture of the box it came in–it can easily fit in the back of a van or possibly a car (if your back seat folds down). No bigger than buying something at IKEA! 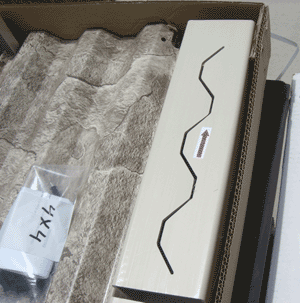 This is the box opened up–you can see the vinyl posts, the steel rails, and a little packet with hardware–funky plastic “nails”. All the pieces had stickers on them to show which side is up. 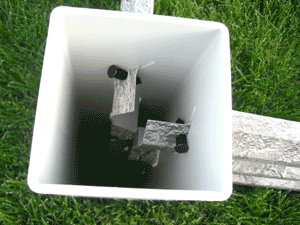 I set the posts down, inserted the rails, and popped the black plastic “nails” through the holes. Voila! Here is the box put together. Okay, this was one of my FAVORITEparts of this box–it was so solid when put together. It was easy to move around and didn’t come apart at all.This box is 4’x4′ and is 14″ deep. Another FAVORITE–2″ deeper than most vinyl or wood beds. The hardest part of this setup was clearing a spot in my gravel for the new garden bed. I’ve learned from experience–this is the time to make sure it’s straight and level! 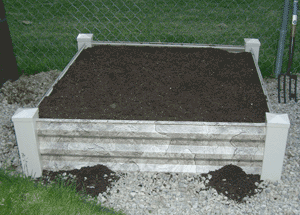 Another FAVORITEpart of this garden bed–the bottom is really close to the ground. There is hardly any gap for soil to “leak” out.Here I added the caps to the posts, and pushed the gravel back around the sides. 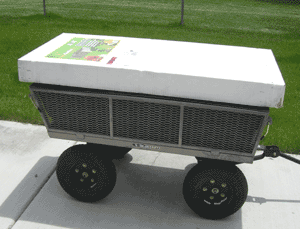 3 cart-fulls of bulk compost ($20). 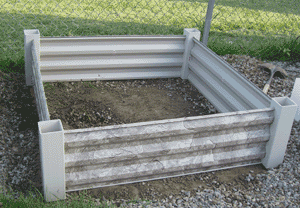 A final FAVORITE part of this garden box–sturdy and strong! I mixed the soil right in the box. I could lean my shovel on the side of the box as I mixed (like a lever). Whenever I do this with my vinyl boxes they move or come apart. I had to buy 3 corners, a T, and a few emitters to attach this to my current irrigation system. I think it cost me $5. I had leftover drip pipe and 1/4 inch drip with built-in emitters. 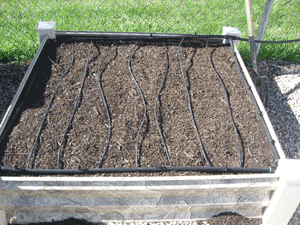 Click here for more information on building a drip irrigation system. 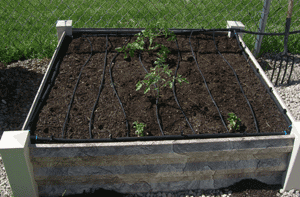 And here it is–I planted 2 tomato plants (cages coming soon! ), beets on the left, and beans on the right. I can’t wait for everything to start growing! All in all, I LOVE my new Easy Garden Box ! It was easy to install and I think it will hold up for years to come! The only way this box could be improved is by making it plain tan. My husband asked me “Is that cammo?” Funny enough, that was my question when I saw the picture on the box! Another drawback is that I’m not sure if you can purchase this box online, especially if you don’t live near a nursery that supplies them. P.S. I received this garden box for free from the manufacturer so I could try it and review it. However, I do not have an ongoing relationship with the manufacturer and do not receive any compensation from them if people purchase this product. I just put one of these together. Inexpensive and sturdy. Love it! I think I’ll get two more. Spray paint can Emily :). I hate the color of grey boxes in the yard after a year or 2 in the sun and the rain, the wood just looks nasty and in a nice housing subdivision, you get funny looks. So I had a bunch of old cans of spray paint and some half used paint gallons mostly white or off white and couple of green, yes green. I rolled the paint over the boxes exterior and sprayed the posts. The green worked the best since it blended with the grass. Looks great and hold up real well. Read more about soil here. It was really good to see you progressing with your gardening. I am residing in west Africa . Here I think the local soil is rich but still I started preparing compost. But would like to know more about the soil. 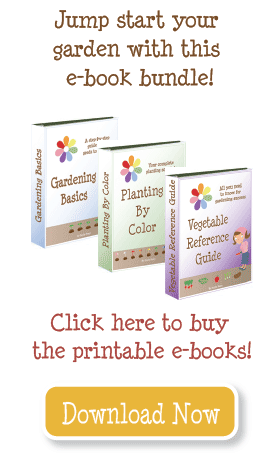 Thank you for the great review of our new Easy Garden Boxes! We always enjoy hearing reviews from new Easy Garden Box users. Just some news I would like to share. 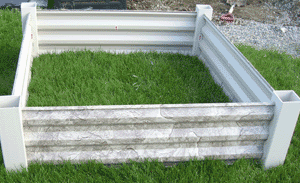 We are working diligently to get Garden Centers set up all across the country with Easy Garden Boxes. For convenience our products can be purchased now on Amazon.com if your local nursery doesn’t have them in stock. I will check back soon and look forward to seeing your tomato, beets and beans grow! $200 for a 4×4, $300 for a 4×8. I am just curious as to what it costs for one of these. They look nice and simple to use. I got nothing when I searched for a nursery local to me that sells these. How much did it cost? Love it. I will have to look and see if my local nursery has one! WOW! I’m glad to see that you were able to buy one of these. I saw them several weeks ago at the home & garden show in Orem and I couldn’t find a nursery who sold them. I can’t wait to find out how much they cost. I am worried that they are expensive….